Yesterday, blog photographers Kate Boone and Joshua Navarro paid a visit to new acquisition The Conversation (1995) by Linda Ridgway, currently on view in the Phillips house. ← The Nominees Are In! 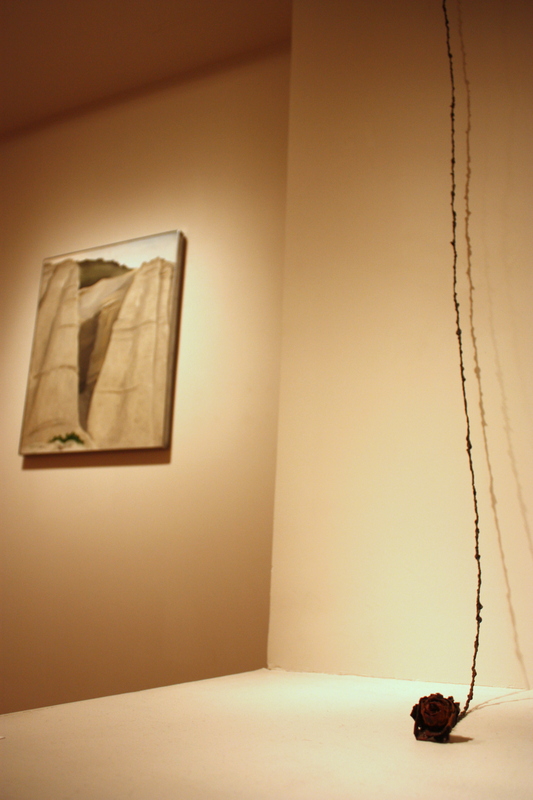 Love the juxtaposition of these two artworks, the rose trailing its long vine, its head waiting to pick up some signal to get the conversation started, like a mic on a long cord stretched to not miss a single word. For obvious reasons,I love this piece. Just wish I had thought of it. The piece is best appreciated in person. 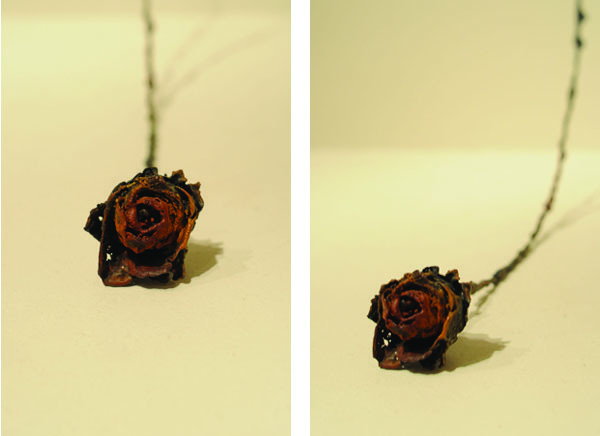 It really is striking, and you can’t help but allow your eyes to follow the exaggerated stem downward to the delicate and perfectly expired flower. The piece forces you pause and reflect. After I took it all in I read the wall label. It’s bronze. Not sure why this exactly surprised me, but probably because of the contrasting association of ephemeral beauty (rose) and solid permanence (bronze; although, yes, bronze may tarnish…again, further associations). Also: not pictured above but hanging in that space to the left of the O’Keeffe/Ridgway duo is another fairly recent acquisition for the museum, Tobi Kahn’s “Lyje” (1991) [https://experimentstation.wordpress.com/2011/09/26/a-new-artist-in-the-phillips-collection/]. I think the space of conversation here among the three works is currently my favorite in the museum.